A couple of collected reprints of note coming your way this November; first up, Humanoids will be publishing a complete edition of Yves Chaland's Freddy Lombard comics. Chaland wrote and drew 5 Freddy Lombard stories: The Will of Godfrey of Bouillon, The Elephant Graveyard, The Comet of Carthage, Holiday in Budapest, and F.52. These were previously released in two out of print hardback volumes in 2003, and then two paperbacks later in 2004/5. The Freddy Lombard series is often described as an 'adult Tintin,' most likely due to Chaland's obvious referencing of Herge's character and adventure narratives in addition to a grimier feel, but those similarities are rather superficial, as the difference in tone and approach serves to set them quite apart. Freddy and his two 'side-kick' friends, Dina and Sweep, are essentially slackers, living in a dilapidated apartment and surviving on money from Freddy's uncle. More often than not, they'll be drawn into things for the promise of money or just for something to do. None of them are very heroic in the traditional sense, and Chaland's writing -the weakest element of his work- means that there's not a great deal to them, highlighted in stories which (earlier on, at least) lack cohesion and often peter out. While the stories span from Belgian castles to African jungles, to war-torn Budapest, Chaland's work isn't without its problematic elements, notably in its portrayal of Africans and disabled people (no doubt argued to be ironic and challenging). But the reason to spend time with Chaland's books is simply due to his irrefutably stunning art. 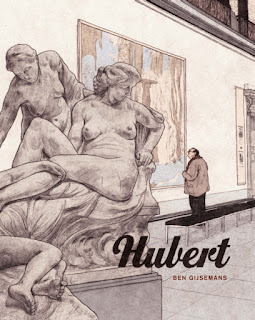 It does so much of the heavy lifting that the narrative is almost redundant; not only is it incredibly attractive to look at, it has an emotional muscle and depth; bold, expressive lines, and a timeless and unified quality that never feels deliberated. I'm a narrative-orientated reader, but Chaland's art is something special and worth the entry price here. 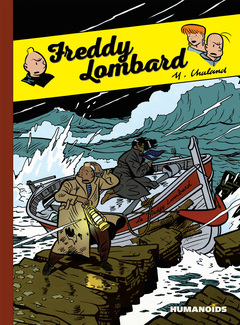 The new, complete edition of Freddy Lombard will release on 2nd November and run to 236 pages, with dimensions of 19 x 2.5 x 26 cm. There's a few preview pages on the Humanoids site, and a much more extensive preview on Amazon, via the 'look inside' feature. Jiro Taniguchi is probably the author I've read most this year. After reading his The Quest for the Missing Girl roughly 3 years ago, I'd seen several articles and pages from various titles online that left me with a view to checking them out at some further point. Early in the year, I read and was hugely impressed by The Walking Man, which served as a catalyst to picking up The Ice Wanderer, A Zoo in Winter, Summit of the Gods, The Times of Botchan, and his Venice travel artbook for Loius Vuitton. I also read both volumes of his diptych, A Distant Neighbourhood, after buying them in Canada; the first book is out of print so seeing a copy priced at a regular rate made it an obvious choice. It seems that situation (with book 2 being available, but book 1 not) is something publishers Fanfare/Ponent Mon are looking to rectify with a new hardback edition that brings together both volumes in one 408 page tome later this November. Essentially, A Distant Neighourhood is a riff on the trope of 'person gets sent back in time in order to better appreciate the present;' Taniguchi bringing on board the precise beauty of his lines and a more reflective consideration to the situation. And so businessman Hiroshi Nakahara, a 48-year-old father of two, finds himself given the opportunity of a 'do-over' as he's catapulted back to his schooldays -with his adult memories and knowledge intact. Now aged 14, having set to rest any reservations regarding his predicament, he settles in to enjoy this second lease of life, even as in the back of his mind apprehension lays in wait for the fateful day when his father mysteriously disappeared forever. Questions mill as to whether Hiroshi can change the past, and if so, whether he should, and what consequences it will all have. 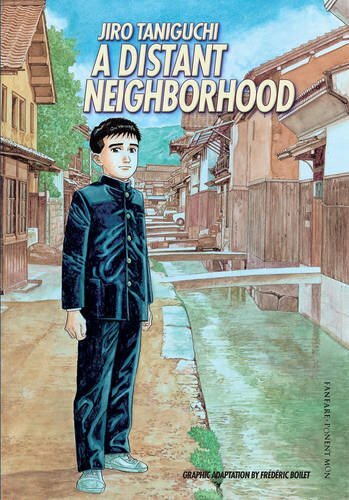 Taniguchi is a unheralded master of comics, with an exemplary, envy-inducing oeuvre, and this is a good, solid place to start for those new to his work.